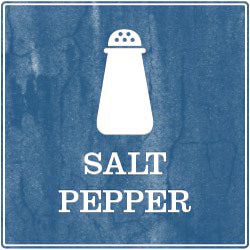 This is a very easy recipe, which can be made with many different kinds of fish. I made it with trouts but you can feel free to use other fishes like see bass, gilt-head or salmon trout. 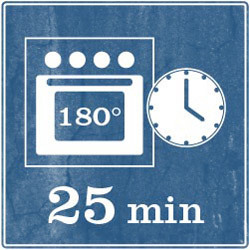 Let's begin by turning the oven on (180 c). 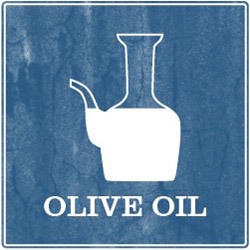 Pour 4 of the 6 spoons olive oil in a baking pan. 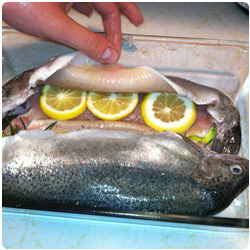 Wash the trout with cold water and put them in the pan. 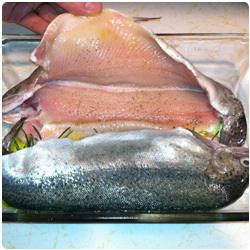 Inside of the trout add some salt and pepper. 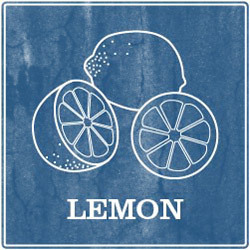 Cut the lemon in fine slices and add them inside the trout. 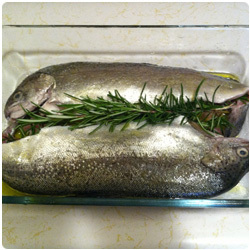 Now add some fresh rosemary and close the trout. Pour the rest of the olive oil on top of the fish. 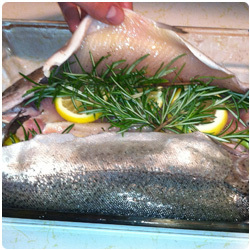 Bake the fish in the oven 180°C (360F) for 25-30 minutes (depending on your oven, you might need some extra/less time). 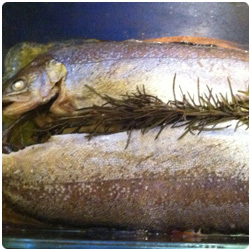 The fish is ready if its meat gets white. Serve warm.